Both Ryan and I like cooking. 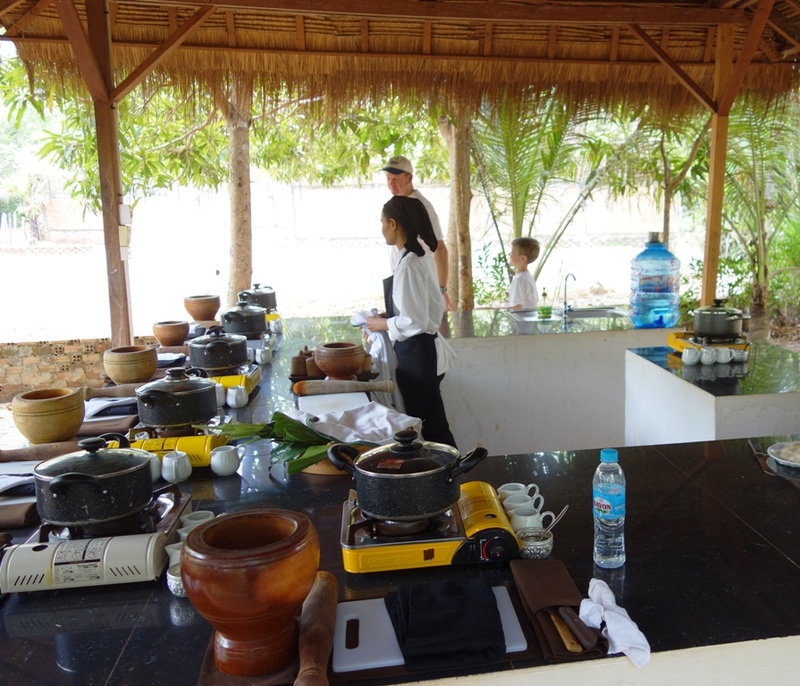 So there was no surprise when, talking about what we would like to do while in Siem Reap we both replied in the same voice: we should take a cooking class! The idea quickly developed into ‘we should do it in each of the four countries we will be visiting here’. Food is one of the best ways to explore a country and its culture. Food tells a lot about a country’s geographical blessings and constraints, its economical status and even its history. 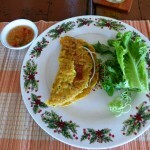 Food and learning how to recreate local dishes is also one of the most wonderful souvenirs you can take home with you. We have been through all four classes at the time I am writing this, and I have to say it was probably the best idea we could have had. Learning about the ingredients used by these cuisines, how they complement each other, how to get the best out of it has been very educational. I am now no longer scared about some of them and I am pretty sure we will be using some of what we learned when we get back. It was also interesting to see how one cuisine differs from another. I have to admit that before taking these classes I was just putting them in the same bucket and although Asian food was one of my favorites, it was hard for me to pin point what I was eating. Some of the basic ingredients are the same, but the way they are treated and combined makes a world of difference. We have then been ushered to the cooking class, which took place in a well organized outside kitchen near a pond full of catfish (which was a separate show in itself, with the fish playing in the water). The teacher was a very intelligent and devoted chef, that liked what she was doing a lot. She seemed a bit shy in the beginning but our interest and inquisitive nature made her open up and tell us some more of her ‘secrets’. The class was hands on, from peeling to chopping, frying, mixing, and tasting and we liked that a lot. I think the only thing that came prepared already was the cooked chicken, but we already knew how to do that one so it wasn’t much of a loss. We also liked how the chef was suggesting substitutes for some of the ingredients she thought we might have a hard time finding back home. 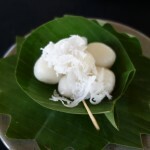 We got to learn how to cook Khmer mango salad, fish amok (a staple dish of Cambodia, which is basically fish cooked in coconut cream) and sticky rice flour balls with palm sugar. Here are the results of our work, as we were gulping them down at the end of the class. 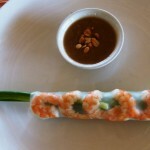 Cambodian cuisine uses chicken, beef and pork as proteins along with fish and seafood like squid, shrimp, and lobster. Frogs, cockles, snakes are also used, although less in the food available for tourists. 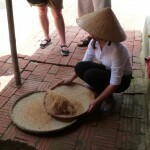 Rice is at the base of almost all of the dishes, in one form or another (steamed, noodles, vermicelli, flour, milk etc.). There are plenty of vegetables to choose from like morning glory, green mango, cucumber, tomatoes, lettuce, carrots, winter and bitter melon, green beans and so on. 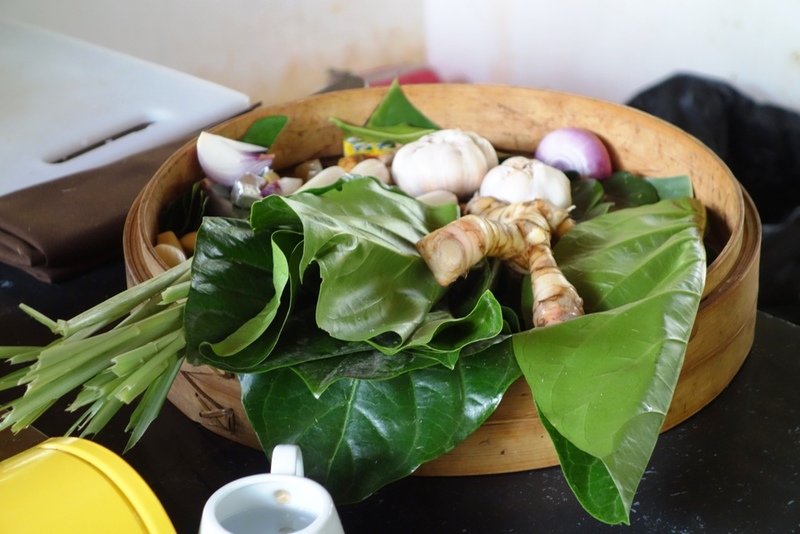 What makes the Khmer cuisine so tasty are the herbs and spices it uses: lemon grass, galangal, turmeric, basil, lime, garlic, shallots, kafir leaves, coriander (a local version called saw leaf herb), coconut milk, coconut cream, peanuts, palm sugar, fish or oyster sauce, salt and pepper. When you look at the list and compare it with a similar list made for Vietnam or Laos, you don’t see many differences. 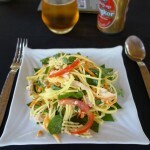 But the use of coconut brings the Khmer food a bit on the sweater side, while the rare use of chillies tones down the heat of the dishes in the neighboring countries. Soy sauce is not a main ingredient here, prahok (fermented fish paste) is what gives the Khmer cuisine its specific flavor. 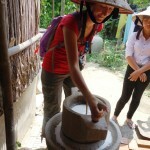 Thuan Thin Cooking Tour in Hoi An was our choice for this step of our cooking adventure. We again started early in the morning and we came back at about 3PM. After the 10 participants were gathered at their office we proceeded with a visit to the market. We got to learn about ingredients, how to pick the freshest ones, what each of them gives to the dish they are cooked in, but also a bit about local interaction and way of living. It was interesting to learn that men never work in a market, it is the women that wake up very early in the morning, gather the products they are going to sell so they are as fresh as possible (some ‘products’, like chickens are actually still alive when sold), and then get to their stalls and spend as much time as necessary to sell what they have. Then they go back to their other job, which is taken care of their household. After we bought what we needed for the class we got into a motor boat and took a ride on the Thu Bồn river, to a remote village where the class was set for us. The ride was fun and gave us a different perspective over the city. We got to see some of the contraptions they use to catch fish. 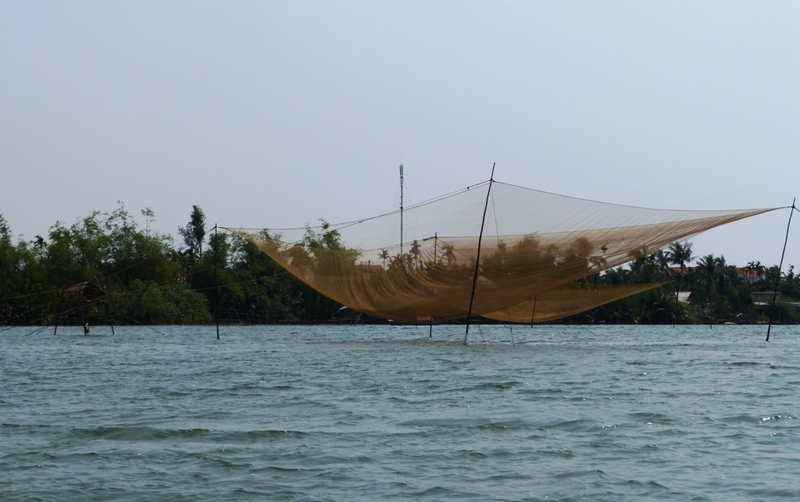 An example are these nets that are used to catch squid. The nets are lowered into the river at night, a light is turned on over the water to attract the squid and once the squid are there the nets are lifted back up, hopefully with a big catch for the day. We then switched to a smaller boat and paddled through a bamboo forest, which kinda reminded me of the gondolas in Venice.Once in the village we stopped at a house where we learned how to treat the rice from breaking it loose from its husk, separating the rice and the husks and then making rice flour used to make the rice noodles and rice paper. It looks fun when you look at the pictures, but I have to tell you that is hard work. 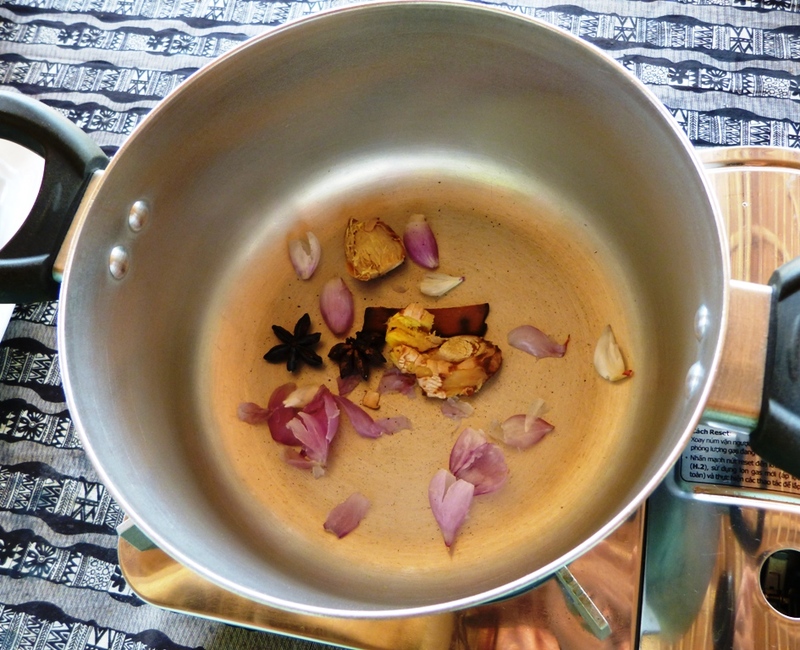 We started by preparing the beef stock that was to be the base for the Pho. 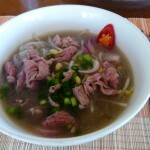 With it, we finally understood what makes the pho in Vietnam stand out from similar soups made in other Asian countries: the use of star anise, cinnamon and ginger, grilled before added to the beef stock. Vietnamese cuisine is greatly admired for its fresh ingredients, minimal use of oil, and reliance on herbs and vegetables. 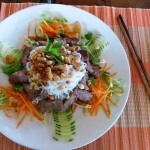 There is a five elements Asian principal that Vietnam fully embraced in its cooking. What that means from a taste perspective is that each dish will have varying degrees of sweet, salty, spicy, bitter and sour. The principle also covers senses, colors and nutrients corresponding to the five basic elements on earth: wood, fire, earth, metal and water. Northern and southern cuisine differ from each other mostly because either colder climate of the north limits the availability of spices and herbs. This makes the dishes here less spicy (pepper is used instead of chillies) and thus not very bold. The central region is the one producing the hottest dishes in the country due to the abundance of spices growing here. 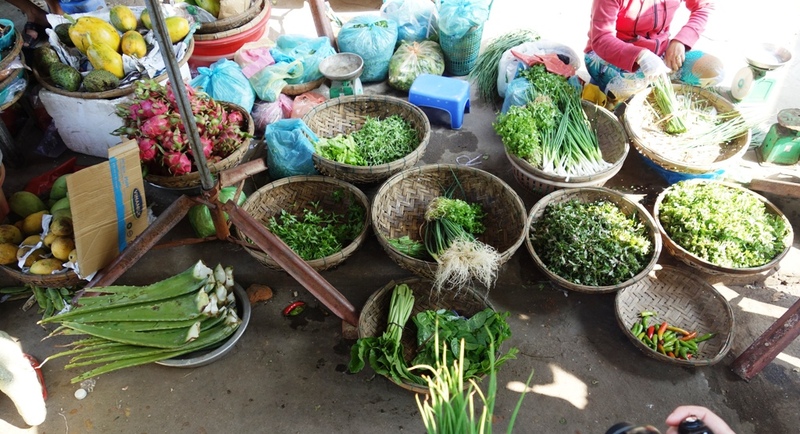 The warm southern Vietnam has plenty of fruits, vegetables and livestock to base their food on. The use of meats such as pork, beef, and chicken is spread country wide. Freshwater fish, crustaceans, and mollusks, such as prawns, squids, shrimps, crabs, clams, and mussels, are widely used. 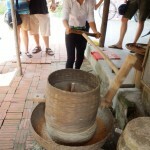 Fish sauce, soy sauce, prawn sauce, and limes are among the main flavoring ingredients. Rice is again the king of the kitchen cooked in more ways than you can think of. Steamed, sticky, noodles, dumplings, pancakes, crepes, fried, rolls, wraps, you name it. 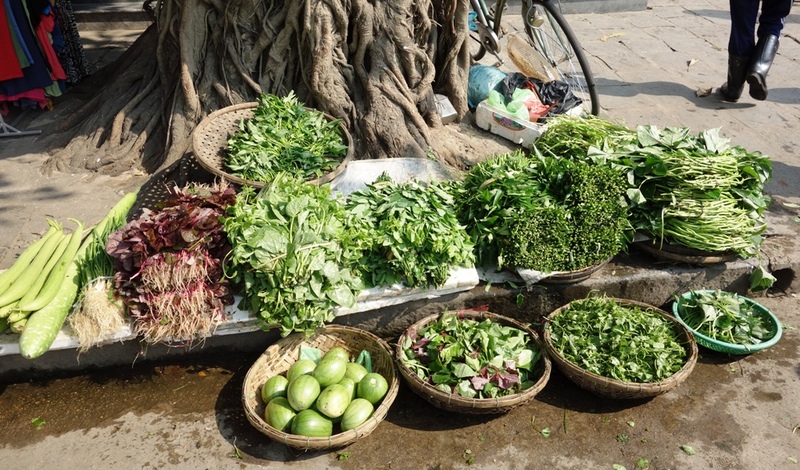 As for herbs and spices, mint and red shiso are more specific to Vietnam, along with the coriander, pepper, turmeric, peanuts, chili, garlic, shallots, and green onions. We have the recipes for the dishes we cooked, just shoot us an email and we will send you the ones you are interested in. 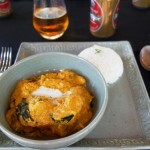 Stay tuned for a sequel, which will cover our Laos and Thai cooking classes. Yummy! You have made me very hungry! Come and cook these yummy things for me and T! Fascinating read. So looking forward to the Thai cooking adventure. You make me hungry!! Will definitely want to try learning the flavor differences.